I was happy to find that the recipe for the sandwich appears in Cafe Flora Cookbook — and it was VERY close to the original. To get closer next time, we’ll use a more “rustic” baguette, like that made by Grand Central. This sandwich is sure to please vegetarians and meat-eaters alike! This recipe seems like a lot of work! There are a bunch of steps, but you can do a lot ahead of time. It’s actually not too bad. I can’t wait to eat it — here goes! This is *so* delicious… and I heart that dipping sauce. Yeah I could totally drink it straight! I wouldn’t go that far, but it does pretty much rule the planet. Now all we need are those super thin-cut sweet potato fries they serve and we’ll be set! I don’t need them… this is so awesome on its own. Preheat the oven to 350 degrees. Mix 2 tbsp of the olive oil and the garlic together in a small bowl. Brush the portobello caps on both sides with the mixture, and sprinkle each side with salt and pepper. Place them gill sides down on a baking sheet, and roast for 25 minutes. When the mushrooms are cool enough to handle, slice each cap thinly at an angle, netting 8-10 slices per cap. While the portobello caps are cooking, heat the remaining 1 tbsp olive oil in a pan over medium heat. Add the onion and cook for about 5 minutes, until it begins to soften. Turn the heat to low and cook the onion for 15-20 minutes, stirring occasionally. If it begins to stick, deglaze the pan with some cooking sherry or water. Cut the baguette into 4 equal portions 5-6 inches long, avoiding the rounded ends. Slice each in half lengthwise. Spread each of the 8 halves with 1 tbsp of the French Dip Spread. Heat a large skillet over medium heat. Place as many of the halves that will fit, spread-side down, for 3 minutes. Repeat for all the halves. Place 4 baguette bottom-halves, griddled side up, on a baking sheet lined with parchment paper. Top each with 1/4 of the sliced mushrooms and grilled onions. Top with cheese. Place in the 350 degree oven for about 10 minutes, until heated through and cheese melts. Top with the remaining halves and bake for 3 minutes more. 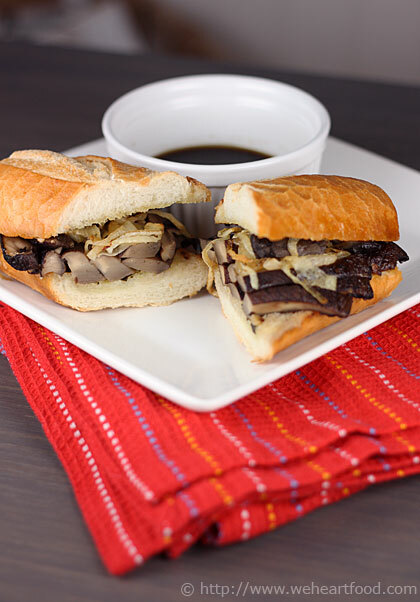 Slice each sandwich in half at an angle and serve with ~1/3 cup of Mushroom Au Jus. Heat the olive oil in a small skillet over medium heat. Add the shallot, garlic, and herbs and cook for two minutes, stirring as you go. Add the wine and cook until mostly evaporated, but still moist. Remove from the heat and cool to room temperature. Add the cooled shallot mixture to the softened butter and mix well. Add salt and pepper to taste. Combine the mushrooms, garlic, and 6 cups of water in a 3 quart saucepan. Bring to a boil, then lower the heat and simmer for about 1 1/2 hours, until the liquid has been reduced to 1 1/2 – 2 cups. Strain the liquid and add the tamari. Keep warm if using immediately, or refrigerate/freeze. This entry was posted on Friday, February 27th, 2009 at 10:04 pm	and is filed under Main Dishes, Vegetarian. You can follow any responses to this entry through the RSS 2.0 feed. You can leave a response, or trackback from your own site. I’m going to have to try this! Portabellos are so good. I am SO buying this cookbook! Yum! This looks so good. This recipe will go straight to my recipes to try list. I would love a bit of that sandwich!! Looks great! This picture doesn’t do this sandwich justice. It’s delicious and salty and flavorful and rich. The picture makes it look dry and boring. But do yourself a favor and make this recipe. It’s mushroom perfection. Even my husband, who hates mushrooms, loved it.